Edinburgh based Gareth Wright has helped Scotland’s PGA golfers become European champions for the second time in three years. 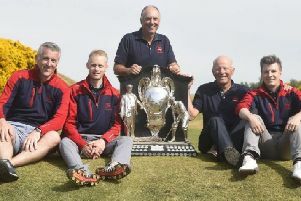 The West Linton-attached player joined forces with Graham Fox (Clydeway Golf) and Graeme Brown (Montrose Golf Links) to record a runaway victory in the PGAs of Europe International Team Championship in Turkey. The Tartan Tour trio carded a 25-under-par aggregate to win by ten shots from runners-up Ireland. Wright’s five-under-par 67 was the lowest last-day score in an event involving 22 teams at Gloria Golf Club in Belek. In a storming finish, he went birdie-birdie-par-birdie before signing off with an eagle at the par-5 18th – He did so courtesy of a prodigious drive followed by a sensational approach that left him with a three-foot putt. In Portugal, meanwhile, Neil Fenwick was lying second, three shots behind Paul Lawrie, heading into today’s final round in the trip being hosted by the former Open champion at Pestana Vista Sol.